Entrepreneur, philanthropist and former New York City Mayor Michael R. Bloomberg discussed the importance of honor and honesty in bringing the country together as he addressed graduates at Rice University’s 105th commencement May 12 in the Academic Quad. Michael Bloomberg gives the 2018 Commencement address at Rice University. Photo by Tommy LaVergne. Founder of Bloomberg LP and Bloomberg Philanthropies, Bloomberg became mayor of New York City less than four months after the Sept. 11 terrorist attacks. His administration raised high school graduation rates by 40 percent, cut crime by one-third and reduced the city’s carbon footprint by nearly 20 percent. In addition, his administration’s economic policies helped to create a record number of jobs. The technology startup he launched in 1981 to provide real-time data and analysis to the financial services industry grew into a global company that now employs more than 19,000 people — including 13 Rice alumni — in 73 countries. He led the company for 20 years before being elected mayor, and since leaving City Hall in 2013, resumed leadership of Bloomberg LP. Bloomberg began his commencement speech with a lighthearted reflection on Rice’s most popular traditions, from Valhalla to Beer Bike. But when reflecting on what to share with the students in his address, Bloomberg said one particularly important Rice tradition came to mind. Bloomberg said he thought it would be fitting for Rice’s graduates to end their time at the university the same way they began it – by hearing a few words about the meaning of honor. Bloomberg said that while the concept of honor has taken on different meanings throughout the ages, the essence of honor has always been found in the word itself. Bloomberg said the commitment to honesty is a responsibility the graduates accepted when they became Owls, and something he called a “a patriotic responsibility.” He recalled the legend of George Washington chopping down a cherry tree and confessing to his father, stating that he could not tell a lie. Bloomberg said former Presidents George Washington and Abraham Lincoln are always glorified not just for their accomplishments, but for their honesty. Today, though, Bloomberg said, many of those at the highest levels of power see the plain truth as a threat. Bloomberg called the trend toward elected officials propagating alternate realities — or tolerating those who do — as “one of the most serious dangers” facing our democracy. However, Bloomberg said there is something more dangerous than dishonest politicians who have no respect for the law — and that is a chorus of enablers who defend their every lie. Bloomberg said the dishonesty in Washington — regarding everything from science to jobs to gun violence — stems from political leaders being dishonest about facts and data, and the public letting them get away with it. He said that the ultimate cause of this is “extreme partisanship,” or the public’s willingness and eagerness to believe anything that paints the other side in a bad light. Bloomberg said when people see the world as a battle between left and right, they become more loyal to their tribe than to our country, and power, not progress, becomes the object of the battle, and truth and honesty become the first casualties. He called the rampant dishonesty in Washington “one of the greatest challenges” that the graduates’ generation will have to confront, noting that George Washington warned against it, calling the passion people had for parties “the worst enemy of democracy” and a precursor to tyranny. Prior to the commencement address, Board of Trustees Chair Bobby Tudor ’82 and Leebron welcomed students, families and friends to the outdoor ceremony. Leebron referred to commencement as a time when the entire university family joins together and he thanked the families of the graduates who contributed “so richly” to the Rice community. “To all of our graduates, thank you for inspiring us with what you have achieved here and giving us so much hope for what lies ahead,” Leebron said. Justin Onwenu, past president of the Student Association, and Sydney Gibson, past president of the Graduate Student Association, also addressed the graduates and shared insights from their time at Rice. Rice conferred 1,945 degrees to 1,902 students, some of whom claimed double or triple majors, including 975 undergraduate and undergraduate professional degrees and 970 graduate degrees (master’s and doctoral). 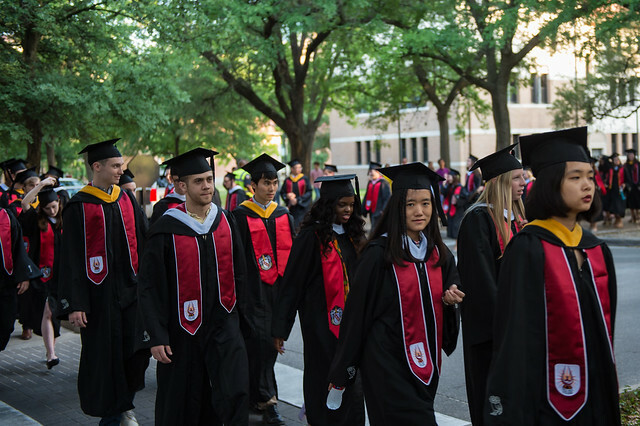 Separate ceremonies, including an evening convocation with fireworks, were held May 11 to individually recognize the recipients of bachelor’s, master’s, doctoral and business degrees, and then all degrees were conferred during the plenary ceremony May 12.